Learn how to make the perfectly crispy kale chips. These chips are seasoned with nutritional yeast and garlic powder for a delicious and healthy snack. Made in just 25 minutes! Over the years, I have found that one of the most important parts of a successful 30 day cleanse is having a pantry stocked with craveable health foods. That means when the mood for something sweet and decadent or salty and savory strikes, I’ve got wholesome and healthy snack foods on hand. That’s the whole reason I make recipes like these raw carrot cake bites and bacon flavored roasted chickpeas. Because I’ve also learned over the many years that I’ve done this 30 day cleanse, that once you fall off the wagon, it’s very hard to get back on. And so, I am here to help prevent me and you from falling off with even more wholesome recipes that will help satisfy those cravings. Today I have a classic. 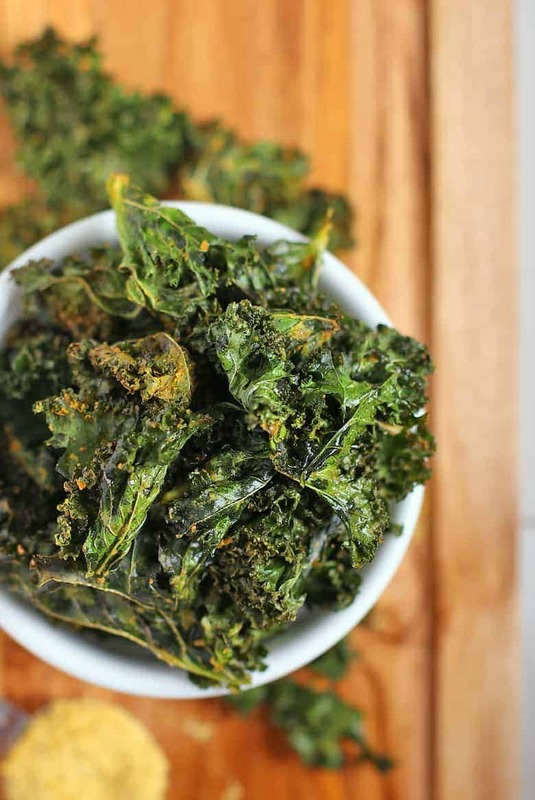 This cheesy garlic kale chips recipe is exactly what we need to satisfy those salty crunchy cravings while staying true to our 30-day cleanse. Intrigued? Let’s take a look at how to make the perfect kale chips. After that, it’s up to you to figure out how you want to flavor your kale chips. For this recipe, I went with nutritional yeast, garlic, and lemon. Yum! To create a cheesy flavor, I use nutritional yeast. Nutritional yeast is a food additive that is made from deactivated yeast. It’s only yeast in that it comes from the same fungi family; it does not taste, look, or work like baker’s or brewer’s yeast. Rather, it is bold in color and flavor. It comes in yellow flakes (see picture above) and has a DELICIOUS nutty cheesy taste. But that’s not all. It is also highly nutritious as it is full of B-vitamins, including the hard-to-get B12 vitamin. 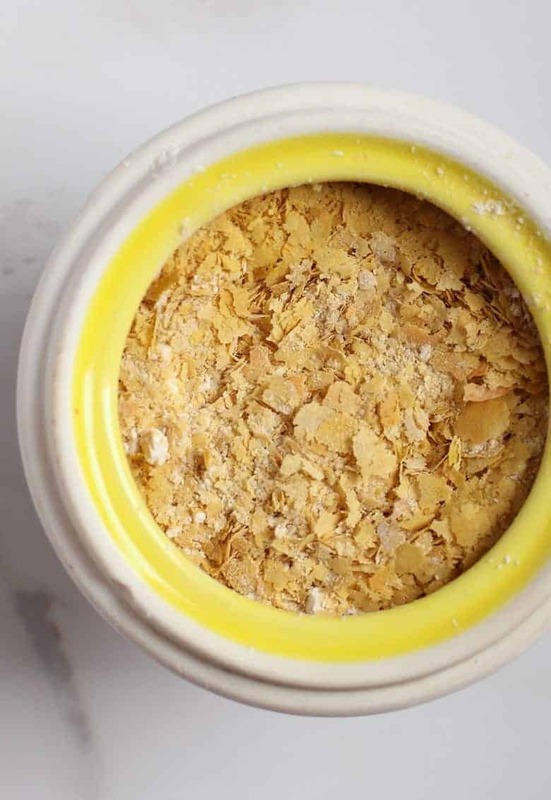 Nutritional yeast is commonly added to foods to give it that nutty cheesy flavor such as popcorn, tofu pasta, cheese sauces, and nut-based cheeses. For more information about nutritional yeast, here’s a great article on it. And if you haven’t tried it yet, I highly recommend you pick some up and start experimenting. I also add garlic powder to this kale chips recipe. 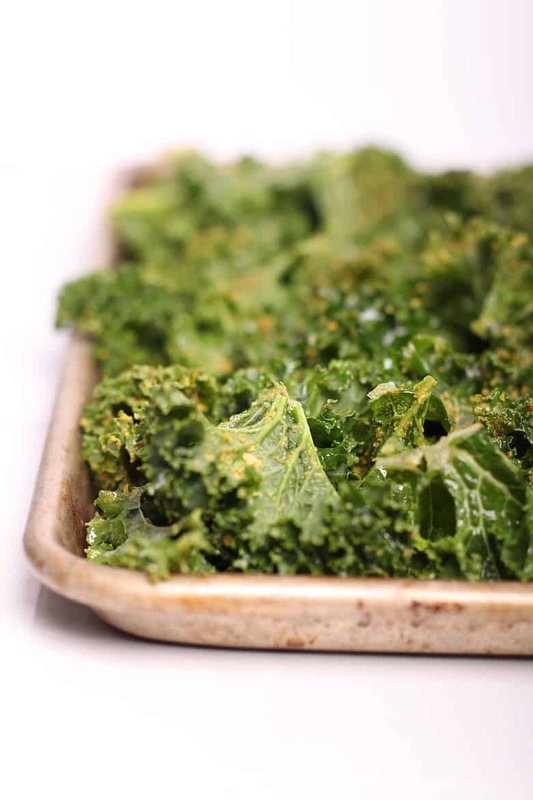 Garlic powder gives the kale a nice punch of flavor and pairs perfectly with the nutritional yeast and lemon flavors. You could also swap out the nutritional yeast, garlic powder, and salt with 1/3 cup of homemade vegan parmesan cheese for a slightly more complex flavor. Now that we’ve sorted out our ingredients, let’s talk about how to make the perfect kale chips. Step one – grab a batch of curly kale. Curly kale is the kale in the picture above. It has a wonderful texture for kale chips and cooks evenly and crispy. While I’m sure other kale varieties will work, you’ll have to remember to adjust the bake time as most other kales are thicker and will need to bake longer. To prepare the kale, remove the stems from the kale and break each leaf into about 4 pieces. You want your kale pieces to be about 3-4 inches long as they will shrink down significantly in the oven. Step two – flavor the kale. Add the oil, nutritional yeast, lemon juice, and salt. With your hands, mix in the flavors by gently rubbing the seasoning onto the kale leaves as though you were massaging the kale. With the flavors well mixed, transfer your kale onto two baking sheets. To ensure an even bake, be careful to not let any of the kale overlap. Any overlapping kale will bake much slower. We want to bake our kale chips at a low temperature. I choose 275 F but you could go as high as 300 F. The low temperature prevents the kale from cooking too quickly and burning. Cook the kale for about 20 minutes, stirring every 5 minutes as the kale on the edges will cook faster than that in the middle. To stir, remove from oven and gently mix and flip the kale with a spatula or large tongs. Return to oven and bake an additional 5 minutes. Repeat until all the kale chips are evenly dark green and crispy. Once the kale chips are done, remove them from oven and let them cool for 5-10 minutes on the baking sheet. Just look at that thing of beauty! De-stemmed the kale completely and tear it into large pieces (about 4 inches long) as it will shrink in the oven. Use your hands to massage the seasonings into the kale so that it absorbs into the kale. 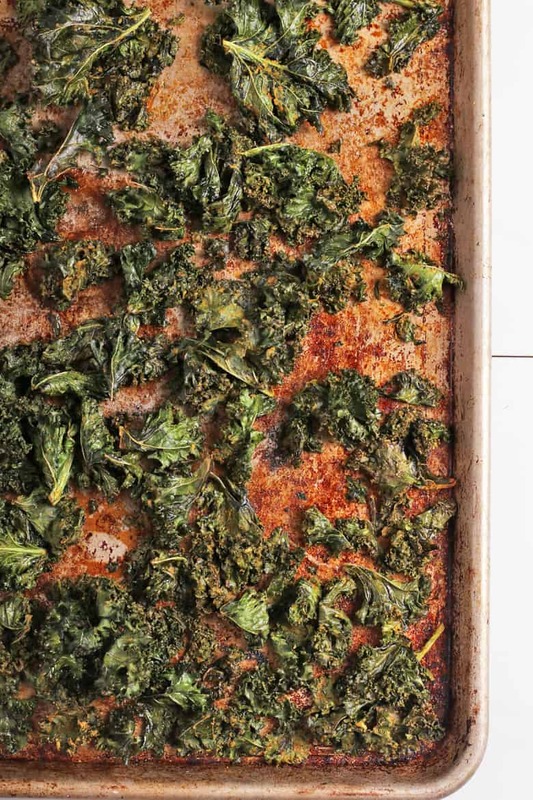 Spread kale onto two baking sheets in a single layer. Overlapping kale will not bake evenly. Stir every 5 minutes, flipping and mixing, so that all the kale is evenly baked. Let the kale cool 5-10 minutes before enjoying. Kale will continue to crisp on the baking sheet. 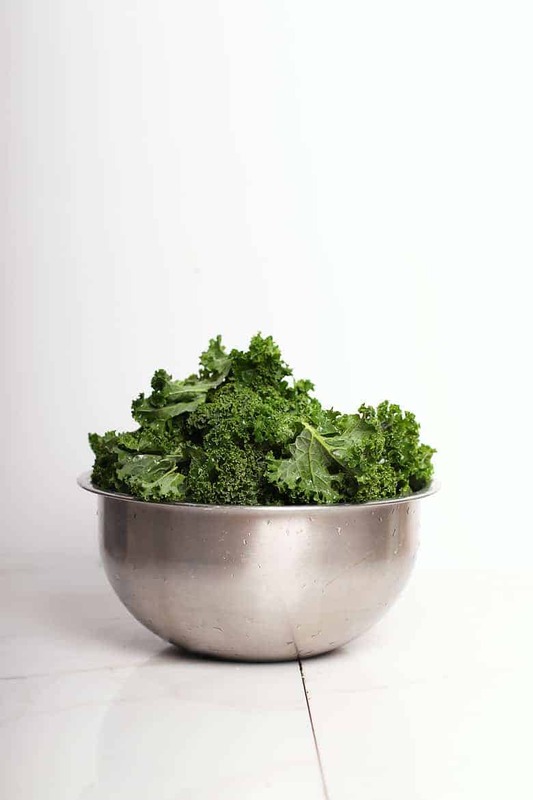 Store uneaten kale chips in an airtight container at room temperature for 2-3 days. That’s it! 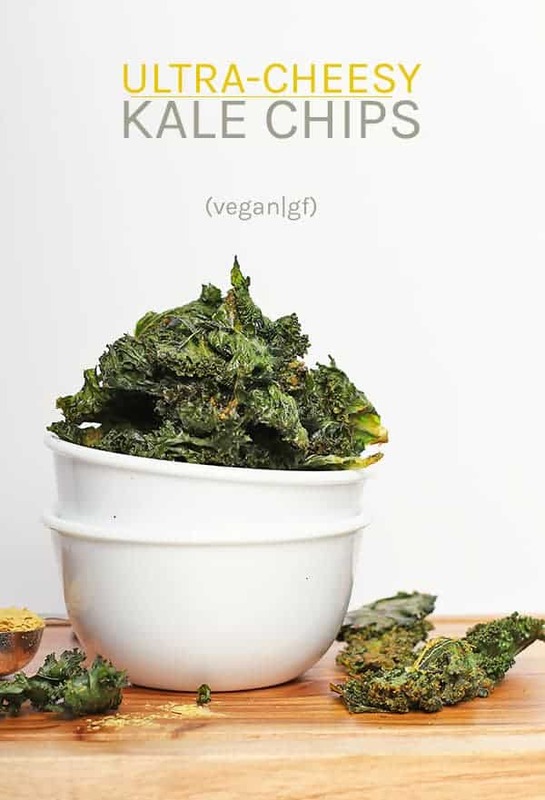 I think you’re ready to try this kale chip recipe for yourself. Check out the recipe card below. Remove stems from kale. Tear into 3 to 4 pieces per leaf and place in a large mixing bowl. Add the oil and gently massage it into the kale. Toss with nutritional yeast, garlic powder, salt, and lemon juice, massaging the ingredients into the kale leaves by hand. Lay on a single layer onto two large baking sheet, ensuring that none of the kale is overlapping. This allows for an even bake. Bake for 20 minutes, stirring and flipping every 5 minutes as the kale on the outside edges will cook faster. Cook until kale is dark green and crispy. Remove from oven and let it set 5-10 minutes before serving. It will continue to crisp as it cools. Serve immediately as a healthy snack or let cool completely before storing in an airtight container at room temperature for 2-3 days. How many cups of kale do you think one bunch would amount to? Thanks! In the kale recipe you did not mention what to do with the oil. Is it also massaged into the kale? Thanks for pointing that out. I fixed the recipe.